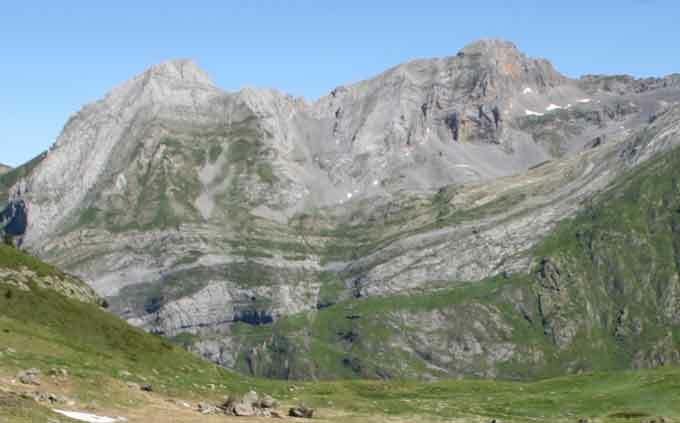 Mountains are one of the most famous visiting sites offered by nature. Many people around the world have developed the hobby of mountain climbing. Today, many camping groups offer only mountainside camping. Well, let’s learn about these amazing features on our earth. A mountain is a geological landform that is very large – exceeding more than a 1000 feet in height. Whereas, landforms below a 1000 feet are called hills. There are many mountain ranges around the planet Earth including Himalayas and Karakoram. In these mountain ranges, there are a number mountains reaching an average height of 10,000 feet. There are also isolated mountains that don’t belong to any mountain range which includes Mountain Denali in Alaska. Our Earth’s outermost rigid layer, lithosphere, is not a single piece of land. Instead, it is made of several pieces joined together like a jigsaw puzzle. These pieces of crust are called tectonic plates. Majority of the mountains on our Earth are formed due tectonic forces. Tectonic forces occur between tectonic plates that are in contact with each other. These plates are constantly moving with a negligible velocity – 5 cm/year. When these plates push against each other, they bulge outward at their boundaries and their height gradually increase and become mountains. This process of mountain formation can take many million years. There are three main types of mountains – according to the way they are formed. All these three types of mountains are formed due to plate tectonics. 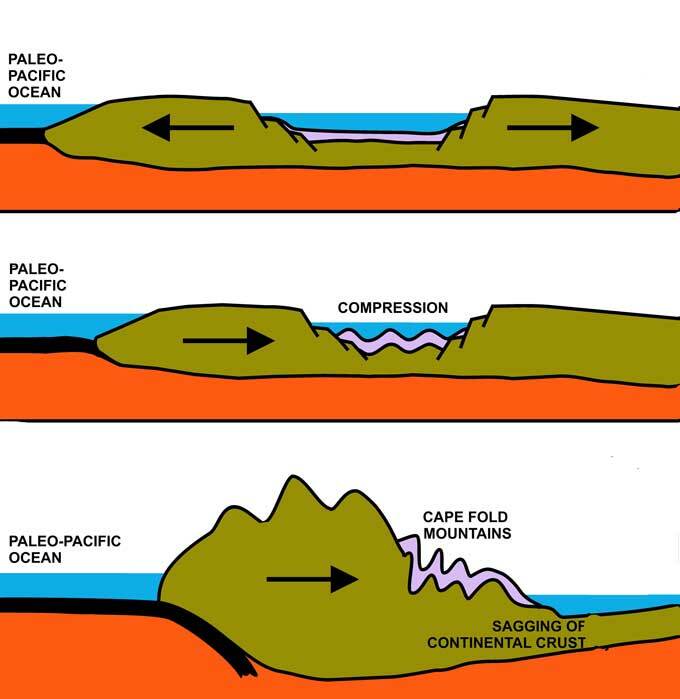 It depends on how plate tectonics interact with each other to form different types of mountains. The three types of mountains are Volcanic Mountains, block mountains, and fold mountains. 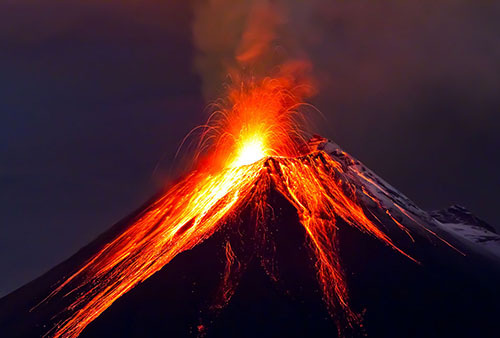 A volcano is a mountain which erupts lava, or it had erupted lava in the past. These kinds of mountains erupt lava when tectonic plates push against each other and one goes below another. As a result, it causes molten rock called magma – which is usually below 100 km – to come-up on the surface and erupt as lava. When the lava solidifies it forms a rocky mountain. When tectonic plates are in contact with each and both of them go past each other, they form faults lines. 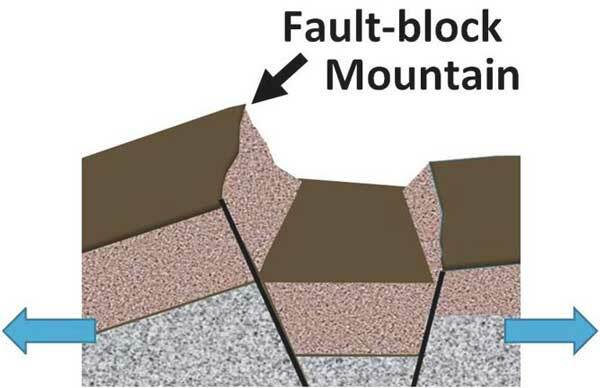 The movement of tectonic plates at fault lines causes surrounding rocks to be raised upward and downward, which sometimes results into the formation of Block Mountain. The rocks that lift upward are called horsts, and the rocks that go downwards are called graben. The horsts are the Block Mountains and graben usually form a valley. When tectonic plates collide head-on with each other, they bulge upward and form a mountain. The reason for the collision to bulge upward is due to higher density of the mantle layer as compared to the plates above it. Many famous mountains ranges are formed due head-on collision of tectonic plates. These mountains ranges include Himalayas, Andes, and the Rockies. Mountains play a crucial role in influencing the local and the global climate of our Earth. A mountain can have a number of biomes in a limited area around it i.e. tundra, taiga, and temperate forests. Mountains store freshwater in ice form at their peaks during precipitations. When these bodies of ice – called glaciers – melt, they give us freshwater in rivers. Most of the highest mountains are located in the Himalayas, and the record of the tallest mountain in the world is also held by Mount Everest – 8,848 meters high – located in the Himalayas. The world record of 2nd largest peak – 8,611 meters high – after Mount Everest is held by K2 which is located in Pakistan. According to the UN Environmental Program, 24% of the land on earth is covered with mountains. 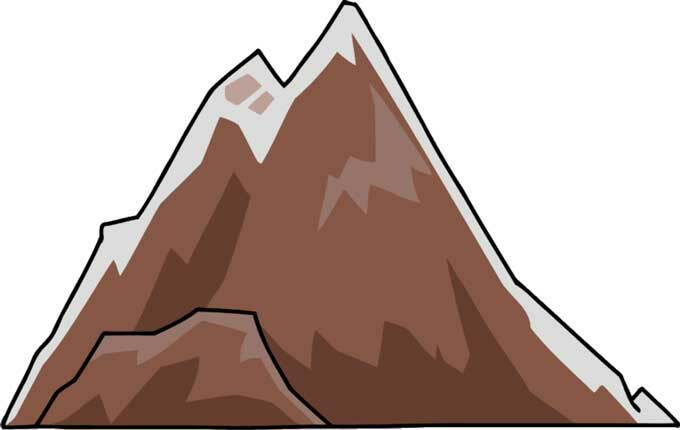 Abdul Wahab, "Mountains," in Science4Fun, April 12, 2019, http://science4fun.info/mountains/.